Etiology: Hamster polyomavirus is a DNA oncogenic virus that induces two neoplastic syndromes in hamsters depending on the age of the animal at the time of infection. This syndrome has been described as transmissible lymphoma when the viral disease occurs in breeding colonies. Incidence: The viral syndromes are uncommon. Transmission: In young animals, the virus is shed in the urine. In adult animals, the virus is shed in infected epithelial cells. 1. Viral infection in young hamsters results in a multicentric lymphoma involving the mesenteric lymph nodes and abdominal viscera. 2. 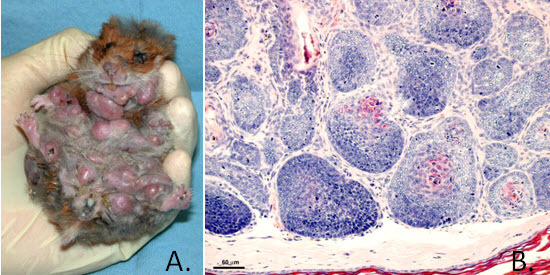 Viral infection in adult animals results in skin neoplasms described as trichoepitheliomas (A., B.). Diagnosis: A tentative diagnosis may be made based on clinical signs and histopathology.